Our Motorcycle Campgrounds wants YOU, prefers YOU, and will take good care of YOU - the motorcycle rider. Our FREE Antique Motorcycle Museum located in the shop area offers visitors a stroll down motorcycle memory lane - featuring the life story of Steven and Shirley and their Cycle-Moore motorcycling family. Also featured is an extensive collection of general motorcycling history including seldom seen vintage bikes and memorabilia. Cycle-Moore is a living, breathing, working museum. Stop in and become a part of the Cycle-Moore family!!!!!!!!!!!!!!! COMING SOON "THE PIT ST0P" TO BE LOCATED BETWEEN THE MUSEUM AND THE SHOP WORKING AREA .... WITH A FREE POOL TABLE AND A FREE REAL OLD TIME TABLE SHUFFLEBOARD AND MUCH MORE .... TABLES TO SET AT AND SHOOT THE BREEZE OR USE THE WIFI .... CAN NOT WAIT TO SEE IT DONE !!!!!!!!!!! Besides our own events, Cycle-Moore is also host to many local, statewide, and national rallies. We strive to bring you the best possible bang for your buck - whether you bring a tent or the largest of RV's, or just want to stop by and say Hi, we work hard to make your visit the most memorable and satisfying experience possible. 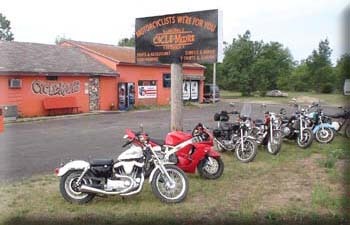 Plan your visit, motorcycle rally, or event with Cycle-Moore today! December 1st THRU NEW YEARS DAY NIGHT - from dusk til eleven p.m. every night - Cycle-Moore Christmas Light Display in the park - FREE! .... DRIVE THRU OR WALK THRU .... IT IS A REAL WARM FUZZY! MAYBE EVEN HORSES AND A WAGON !!!!!!!!!!! !